Thallium (pronounced as THAL-ee-em) is a heavy metal with considerable toxic properties, represented by the chemical symbol Ti . Under normal atmospheric conditions, the pure element undergoes reaction with oxygen and moisture to form oxides, thereby limiting its uses . 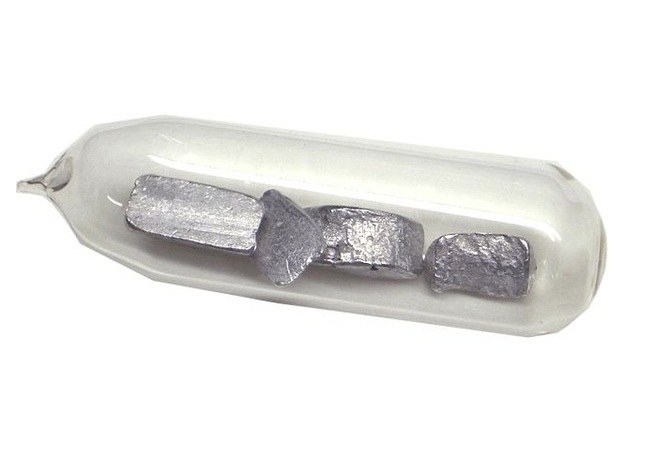 A member of the alkali metal family , it has 30 isotopes with mass numbers ranging from 179 to 210 out of which the stable ones are a mixture of naturally occurring thallium-203 and thallium-205 . It is can be naturally found in pyrite ores present in the earth’s crust as well as manganese nodules on the ocean floor. In most cases, it is obtained as a byproduct of sulfuric acid production, and zinc, lead, and copper refining. 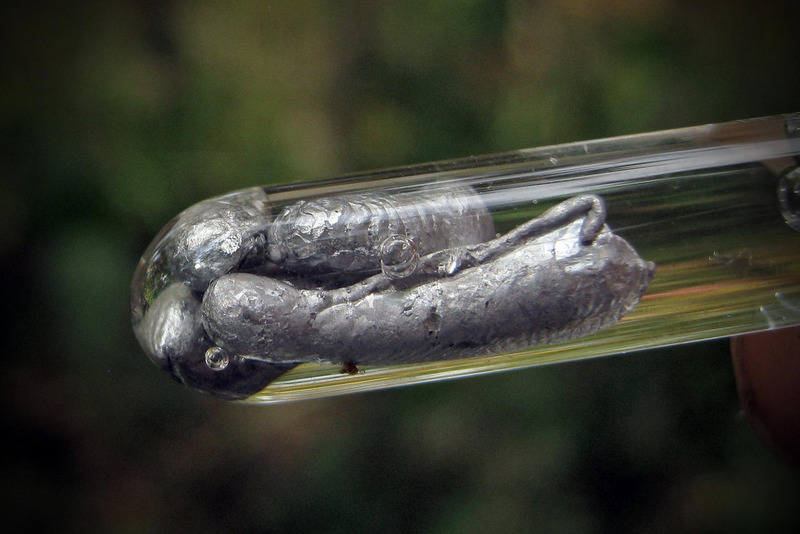 Origin of its Name: The element got its name from the Greek word “thallos”, meaning a green twig. 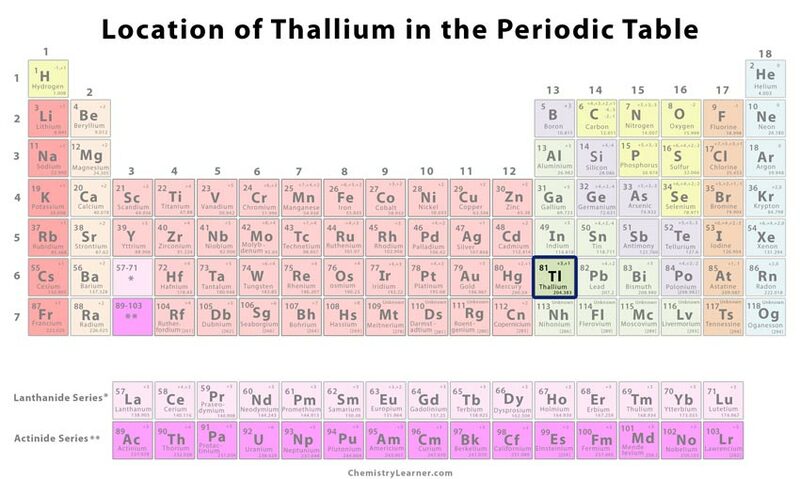 Who Discovered it: The British scientist and chemist, William Crookes, was the discoverer of thallium. At the Royal College of Science in London, Crookes used a spectroscope to observe the presence of tellurium from the sludge of leftover sulfuric acid by his friend at the laboratory. 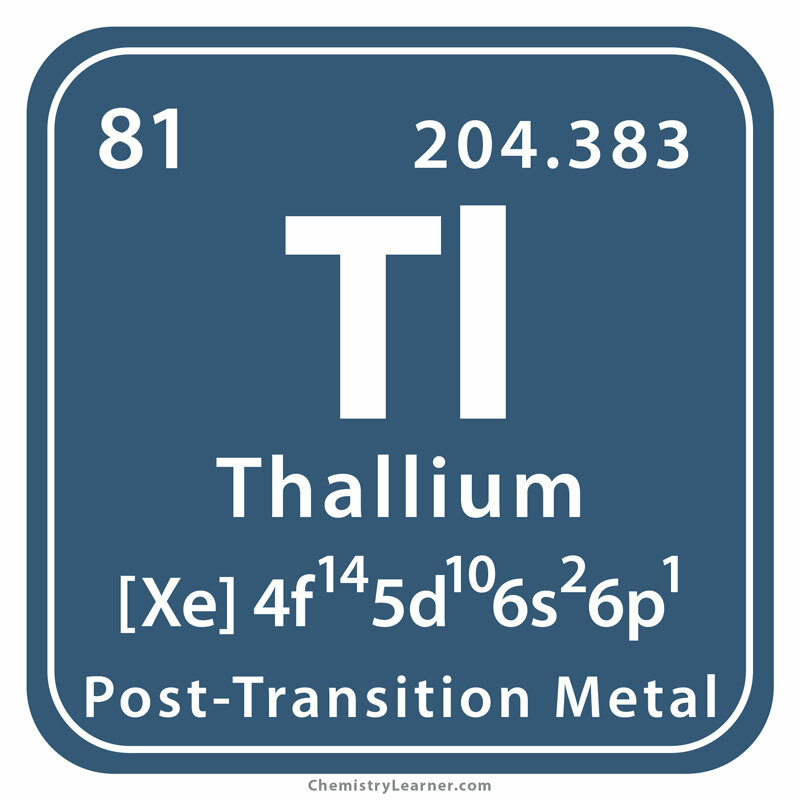 However, he ended up detected a green line in the spectrum of the acid sample, confirming it to be a new element, named as thallium. However, his discovery was made official only in March 1861 in Chemical News despite the limited research done on the element . In 1863, Claude-August Lamy of Lille, France carried further studies of the new metal in details and even made a small ingot. As a result, The French Academy gave the entire credit of the discovery to him. Since the ingot was displayed at the London International Exhibition in 1862 where it was claimed to be a new metal, Lamy was awarded a medal. However, Crookes was disappointed since he was the original discoverer due to which another medal had to be conferred on him . It is combined with sulfur, arsenic, and selenium to make low melting glasses . 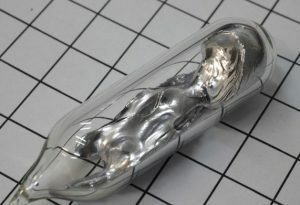 Alloys of mercury with 8% thallium content are used in low-temperature thermometers and switches as they have a melting point lower than 20°C . 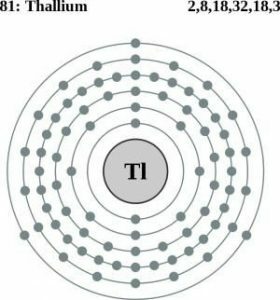 Thallium-201, a radioactive isotope of the element, is combined with dipyridamole  to be used as a radiopharmaceutical medication to conduct heart stress/exercise test, also called as thallium viability study [6, 7]. 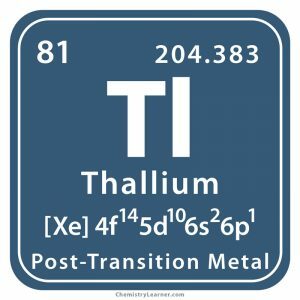 Since thallium has carcinogenic and teratogenic properties, its exposure through ingestion, inhalation, or direct contact can have severe side effects on health. It has also been associated with neurological problems, hair loss, and kidney damage . One of its compounds, thallium sulfate was used as a rat and ant poison in the USA until 1974 after which it was banned from household use due to the high level of toxicity. The price of the metal may vary between $35 and $45 per pound.